Gamers, rejoice! Gaming isn’t just for the gamer crowd anymore. In fact, gaming is making its way into people’s homes all over. Whether it’s gathering around classic games such as Scattergories, Clue or Pictionary or trying out new tabletop games such as Eldritch Horror, Dead of Winter, or Small World, there seems to be a game out there for everyone, and people all over are putting their skills to the test with game nights. If the idea of getting dressed up and paying a cover charge to a bar with overpriced beer doesn’t sound appealing, or if you’re just looking for a low key night at home without spending a lot of cash, you may want to consider hosting your own game night. 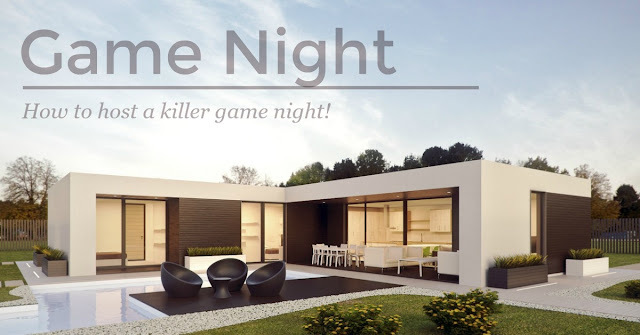 Read a few tips to help you put together a killer game night. Everyone has different interests. While some friends may enjoy a lighthearted game of Apples to Apples, they may not love the idea of rolling up a halfling mage for a marathon D&D session. Consider what type of game night you want to have and plan your guest list accordingly so that everyone has a good time. After you’ve decided what type of game night you want to have, you’ll want to start planning the games to keep your guests entertained. Have you been dying to try the latest expansion of Munchkin? Maybe you’ve never played the popular adult party game Cards Against Humanity. Make sure you buy the games ahead of time so everything is unwrapped and ready to go. You can even ask your guests if they have any favorites and do a game potluck, where each attendee brings their favorite game. Every great party has great food. You’d be surprised how quickly you’ll work up an appetite when you’re plotting against your friends in a heated game of Monopoly. Pick up snacks ahead of time so you don't have to run out during the party. Make sure nobody has any allergies or special dietary restrictions, and keep that bowl well stocked with munchies all night long. Some people enjoy themed game nights. Think medieval-style foods and decor for a D&D night or a casino theme for a night filled with card games. Theming your game night can be fun but takes a lot of preparation, so start brainstorming early to make sure your food, drinks, and ambiance complement the mood of the night. Game night doesn't have to stop when your guests leave. Thanks to excitement around mobile gaming, people are connecting with their friends through competitive online games when they’re too busy to have a sit down game night. You can play a variety of mobile games such as Trivia Crack, Words with Friends, and others against your friends while you’re on the go to keep the fun going all the time! No matter what type of game night you plan, it’s important to remember to not let it stress you out. The most important part of having a game night is enjoying the company of your friends and loved ones, so don't take yourself too seriously and enjoy yourself.